We used Quest Migration Manager 8.10 recently in a project at a customer for a combined Active Directory and Exchange migration. Overall target was to integrate a Windows 2003 domain cross forest and cross org into the central AD Forest with several child domains. Since from mail perspective our migration source was Exchange 2007 and our migration target Exchange 2013, we decided to use the Native Move Job option along with the Migration Manager for Exchange Agent (MAgE) services. Source Domain in Single Domain Forest with Domain Controllers on Windows 2003 and Exchange 2007 as mail system. Target Domain was one of several child domains in the central Forest. All domain controllers running Windows 2012 R2 and mail system was Exchange 2013 SP1. All Exchange 2013 servers had been deployed to root domain which also kept all important system and admin accounts. To limit complexity in the setup of Quest Migration Manager 8.10, we decided to use a single administrative account from target Forest’s root domain and granted all necessary permissions in the domains to run both, Active Directory and Exchange migration. Only for access to source Exchange 2007 when running the move request, we used an account from source domain with Org Admin permissions. Installation of Migration Manager 8.10. on a member server in target domain (best practice recommendation) including all cumulative hotfixes went smoothly. After successful Directory Synchronization, we connected to the Exchange source and target Organization and finally deployed 2 Instances of the MAgE agent for native mailbox move jobs on our agent host and console server. Note: For agent hosts Windows 2012 R2 is currently (May 2014) not supported. You have to stay with Windows 2008 R2 here. However, after starting the agent services running with our administrative account , we recognized, that we could not open the log file of the agent in the Log Panel inside the Migration Manager for Exchange GUI. We searched for the log file and found it in “c:\progamdata\quest software\Migration Agent for Exchange\NativeMove directory”. Waiting for agent settings: Not found: (&(objectClass=serviceConnectionPoint) ….. Agent is not ready to start. Agent going to sleep at 1 minute. Obviously the agent tried to execute an LDAP query to find a connection point in Active Directory. Note: Currently QMM 8.10 uses 3 different systems to store configuration data: An ADLDS server, a SQL Server Instance and the Active Directory (ADDS). We ran the query which was shown in the log file against the target domain and we could find the Service Connection Point (SCP) immediately in the System container of the domain naming context. The Service Connection Point consists primarily of the keywords array attribute and the serviceBindingInformation attribute. The QMM MAgE looks for the serviceBindingInformation attribute to get its SQL connection properties. In SQL it will finally find all information to process the collection. We do not know why Developers at Dell Software made this process so complex. However, in our setup the agent could not find the Service Connection Point, because the agent was looking in the domain, where its service account was located and this was the root domain of the forest while the agent host had installed the SCP during installation in the child domain where the computer account was member of. 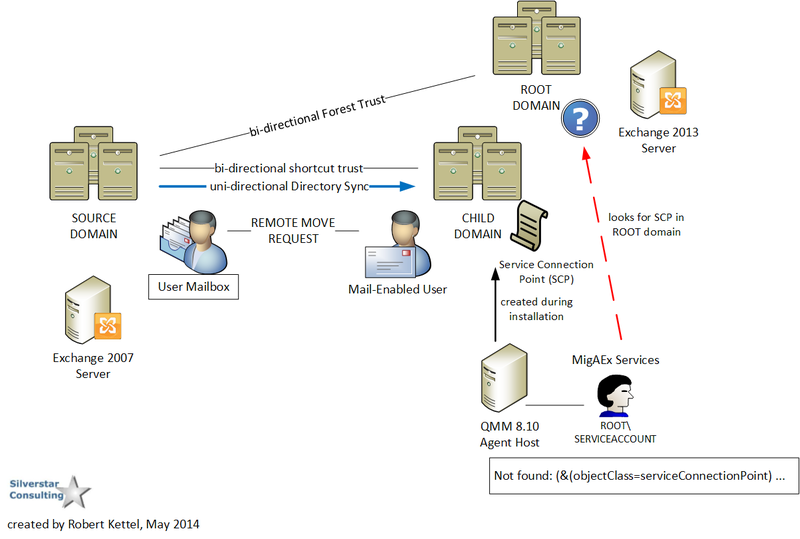 Switching the agent host and agent service account to an account from child domain would have been a solution, but was not in compliance with customer policy to host all system accounts in root domain. Moving agent host and console to root domain would not have meet best practices and would have interfered running directory synchronization. We manually created a Service Connection Point in the root domain and copied all serviceBindingInformation values over. The agent started immediately and worked without errors. For future design we can only recommend to store Service Connection Point in the Configuration Partition as Exchange and lots of other software. Using the domain naming context will always lead to problems in a big Enterprise environment with Active Directory consisting of multiple domains in a forest.